Each studio flat sleeps up to 4 people. Combined living/sleeping room - wardrobes & cupboards, dining suite, two single/one double bed (two single beds or put together as one double), a double sofa bed. Balcony with outdoor furniture - ideal for al fresco eating. Bathroom - with bath & shower over the bath. Kitchen - including 4 ring electric hob, fridge & microwave, toaster, kettle, coffee machine. Entrance hall - with a place for your outdoor wear; Lockable storage in the basement of the adjacent building for skis, snowboards and mountain bikes. There is also off road car parking. There is a lift in the building. The Rental Agreement shows any extra costs payable to the housekeeper on arrival. You see the link to this when booking. The extra costs can also be found in the Availability section, just below the calendar. Welcome to winter season 2018 to 2019! Holidays are always fun in the beautiful Alpine village of Kaprun. This is the ideal location for a holiday in the Austrian Alpsin Kaprun spring, summer, autumn and winter for you to have a fantastic holiday. Kaprun has plenty of activities to suit everyone. All year skiing available on the Kitzsteinhorn Glacier with plenty of skiing available in Kaprun village and Zell am See during the winter. The ski lifts in the village centre are walking distance and are open throughout the winter season. Don't leave it too late to book your skiing holiday. Book one or both of our self-catering studio flats. In warmer weather you can enjoy drinks and meals on the balcony. Our guests always comment on how much they enjoy all the things there are to do in the snow and the sun. 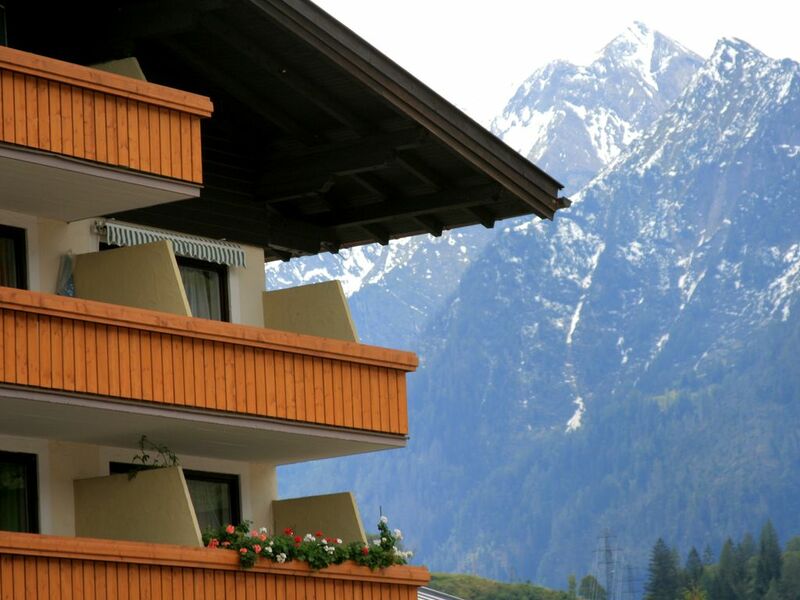 It is close to all major attractions in Kaprun, including shops, restaurants and bars. This is such a beautiful part of Austria there is every reason for you to expect an enjoyable stay. Ideal for lakes & mountains holidays all year round, including all year skiing & snowboarding, plus walking, mountain biking, golf. 50 miles from Salzburg with easy access by road, train & bus. Kaprun is at the heart of the action with a huge choice of summer and winter sports available for all, or just relax and enjoy the wonderful scenery all around! The village location means you are close to real Austrian mountain countryside in all its beauty. The property is only 5 minutes walk from the centre of Kaprun and all its amenities. The nearby town of Zell am See is next to lake Zell. There is a Billa Supermarket 5 minutes walk away. Things to do in Kaprun: RESTAURANTS: There are many restaurants in Kaprun, including one opposite the apartment building. Here are a few ideas of things to do and places to visit on and around Kaprun. During the winter the ski lifts in the village centre are walking distance from the flats and are open throughout the winter season. All year skiing is guaranteed on the Kitzsteinhorn Glacier. There are plenty of ski equipment hire shops and ski schools in the village. With 3 Snow parks on the top, the Kitzsteinhorn gives you: freshly reshaped parks every day with 70 obstacles and this year there is a new super pipe. Why not make this year the start of your snowboarding fun! There is a wide-spread network of paths with cafés and mountain huts. Please take sturdy footwear, winter-proof clothing. Guided snowshoe and winter hiking tours are also available. There are also hiking trails through Kaprun if you simply want a leisurely walk in the afternoon. BIKE HIRE: Zell Am See Bike Rental Adventure Service, Steinergasse 9, +43/6542/73525 Intersport Scholz, Bahnhofstraße 13, +43/6542/72606 Sport Achleitner, Postplatz 2, +43/6542/73581 Kaprun Bike Rental Intersport Bründl, Sigmund Thun Straße 570, +43/6547/8388-32 Intersport Rent Moreau, Schloßstraße 751, +43/6547/8715-16. HORSE RIDING: Zell am See Limberghof, Bruckberg 1, +43/6542/57407 Porsche Reitanlagen, Porsche Allee +43/6542/57362 Reitanlage Badhaus, Schloß Prielau - Nordufer, +43/664/5515902 Kaprun Fun & Trekkingsport Zell am See/Kaprun, Sigmund-Thun-Straße, 74 +43/664/2010818. BOAT TRIPS: Three boats from the ‘Schmittenhöhebahn’ company operates on Lake Zell, depending on the time of year. LEISURE CENTRES There are leisure centres in both Kaprun & Zell am See. Both bathrooms were partially renovated in the last few years. We spent a week in this flat. I can't say something bad, because this studio is true to its price. Nice place, bus station, big bathroom and balcony . But one moment was not a pleasure. The manager doesn't speak English, it was a problem , i paid an Austrian tax for week for all family, but Kids under 15 years old will not have to pay the tax. I coudn't explain this, so I paid a tax for 9 years old daughter. Some problems was with bed linings, a pillowcases didnt fit a pillow. I took several from home, so i solved this problem. One thing is really need to be, it is a Standtrockner or Wäscheschirm. or something like this, it can be a rope in the bathroom. We are thankful that you found it a good for family holiday Thank you for mentioning that nice place, bus station, big bathroom and balcony. We have passed your comments about the bed linen, pillowcases and the confusion with the tourist tax to the housekeeper. A most enjoyable week in the beautiful town of Kaprun. Very central for skiing. Comfortable, warm, well equipped small apartment. Very accessible to all amenities. Ski rental and buses to resorts only a few meters away. Short stroll into the town centre. Excellent parking facilities. Very friendly manager who was most helpful and kind to us. The apartment was perfectly adequate for myself and two daughters and we all enjoyed our stay. Well equipped kitchen with all utensils. The apartment was warm and comfortable. It was excellent value and communication with the owners Sylvia and Stephen was very good. I would highly recommend it and hope to return if possible in the future. We will pass you positive comments to the manager that you found him most helpful and kind. Future guests will be grateful to know that it is very accessible to all amenities. We are thankful that you say it was very central for skiing and a short stroll into the town centre. We are always grateful when guest describe it as a comfortable, warm, well equipped small apartment. We are often told the apartment is well equipped kitchen with all utensils and that it is warm and comfortable. Thank you for highly recommend it and we look forward to you staying as a guests in future. We stay for the first time in 2012 in the same apartment from Kaprun. Then the apartment looks much better! On the other hand, the apartment was clean and warm. We believe, however, that a complete renovation of the apartment should be carried out. We will pass your positive comments to the housekeeper that the apartment was clean and warm. The housekeeper will let us know if any renovations are required in the flat. Nobody else has told us that a complete renovation is needed. It certainly did not need any the last time we visited. It is fascination that you found it was a lovely location. We will pass your positive comments to the housekeeper regarding it being nice and clean. Potential guests will be pleased to know that you enjoyed it a lot. Mattresses need replacing could feel the springs. Thicker curtains needed see through ones not great when u r directly opposite a hotel. Extra duvet and pillows available but no linen for them. Self catering but no oven. Info pack would have been helpful. Not very cosy and dated decor everything tables lamps etc felt like someones left overs. Had a great holiday as snow fantastic but very disappointed with appartment. First time we have had to say this when staying in Austria. Our 6th time to Kaprun. We are sorry and surprised that you were unhappy with some aspects of your stay. We have passed your comments to the housekeeper. We normally receive plenty of positive feedback about the property and repeat bookings. We always try make the information given as accurate as possible. Before arrival we always advise our guests that if something in the flat does not work or is broken to tell the housekeeper during their stay. We remind them that the housekeeper will not be able to solve any problems for them once they have left. Regarding the property needing TLC, his year we have spent a large of money on the property installing brand new triple glazed windows and door. We have not been informed previously that mattresses need replacing or that our guest could feel the springs. In fact the guest who stayed immediately before this stayed for over a month and gave it a good review on HomeAway. She did not mentioned a problem with the mattresses. However we will ask the housekeeper the check the mattresses to see if they need changing. Even though the curtains are not thick we do not agree that they are see through. The duvet and pillow required by guest always have their covers and pillow cases put on before the guest arrive. The extra duvet and pillows mentioned are for use when they are three or four guest staying. As there were only two guests there was no need for the extra sets to have bed linen provided. We send our guest plenty of information beforehand via email. The furniture and decor are as seen on the website. Other guests have said that they have found the flat cosy and comfortable. Stayed at the aparment for over a month, had a great stay in a great location. The Hausemeister was very helpful even though his lack of english. Would definitely stay here again. Great apartment for the price you pay. Thank you saying it was great location with everything you need. We are often told the housekeeper is very helpful . Future guests will be grateful to know that you would definitely stay here again. Other guests have said that is a great apartment for the price you pay. Bus stop: Outside the building; Supermarket: 2 minutes walk; Village centre: 5 minutes walk; Restaurant: opposite plus many in the village centre; Bank: 5 minutes - in the village centre; Zell am See & Lake Zell: 10 minutes by car. Golf: You can play golf in beautiful scenery from April to November on two courses at the Golfplatz Europa Sportregion between Zell am See & Kaprun. The two courses are called 'Schmittenhöhe’ and ‘Kitzsteinhorn’ and they are graced by beginners and professionals. Golfstraße 25, A-5700 Zell am See Tel: +43/6542/56161. Ski: Ski Slopes for all abilities including summer skiing: The white glacier slopes of Kitzsteinhorn are ideal for skiing and snowboarding not only in winter but also in summer. At a height of 3,029 m (9,938 ft), you'll find summer skiing pistes. There are ski schools for children and adults, cross country skiing, as well as ski huts for après-ski. In the ‘Europa-Sportregion’ there are 130 km (81 miles) of ski runs, over 59 pistes and four mountains, 57 cable cars and lifts and snow machines. Ski Bus: The bus stop is only 1 minute walk from the flats. There are at least three ski buses an hour to take you to the Kitzsteinhorn (high-season). Once at the bus station in the valley you can either take the glacier jet or the cable cars directly towards the peak. Buses start running at 8 a.m. There are two buses an hour taking skiers to Schmittenhöhe. Ski Rental : There are numerous hire shops for skis and snowboards. Several shops even offer family rates.